My manicurist is going to give me That Look again...but this is just how I ROLL...after every fill (nails = fake, in case you couldn't tell...I use them as 'picks' on the harp and having done so for [ohmygah, REALLY?!] 17 years now find it about impossible to play without, otherwise I would SO TOTALLY give them up because they fit the rest of my life about as well as pearls on a pig, but I digress), I SWEAR that henceforth, I will always, ALWAYS!, wear gloves when rooting around (ha! 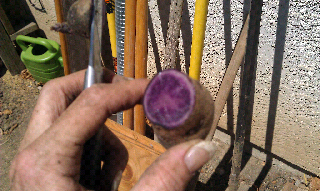 Potatoes! Rooting!) in the garden...and then, within hours, my gloves are annoying me, or getting in my way, or not allowing me to FEEL the difference between a rock and a potato and zip! Off they come, and two seconds later, my hands look like this. And because I have all the pride of a busted fence slat when it comes to Such Things, I post pictures of them looking like that alllllll over the Internet. Ahem. 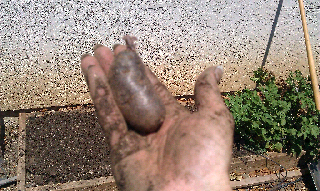 But nevermind, and quit looking at my filthy hands anyway - lookit that ADOREABLE potato! Isn't it the cutest thing EVER? And such an overachiever...it was all, "Wait, don't eat me! I can do so much MORE for you! Look! I'm all sprout-y! You should totally plant me instead!" So I cut its head off and did, the end.